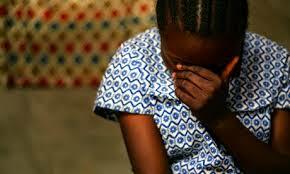 Meru Father caught defiling his 5 year old daughter in a miraa plantation. The man is said to have lured the daughter in the plantation and started having s#x with there but did not do it for long before the villagers caught him in the act. The people became suspicious when they after they heard the girl screaming and immediately ran into the farm finding the guy in the middle of it. He was lucky to find an opportunity t flee but left his phone behind and the villagers confirmed it was indeed the father of the girl. According to eyewitnesses, the guy left the house with his daughter and said that they were going to the market to do shopping, but 30 minutes later, the girl crying from the farm and that is when some strangers who responded found the dad busy in the act. The area police boss said that they are still hunting the man down and are sure that they will arrest him soon.